In January of 2011, a Winnipeg-based film crew received word their visas had been approved, travel was arranged, and they were about to embark on the production of a lifetime. A crew of prairie-dwellers left to join Morden-born David Rabinovitch for one month in Istanbul, Turkey - a megalopolis of over 13 million people. The Spanish lemon sector is undergoing a true price crisis that, in the case of the top lemons, dropped up to 25% at origin compared to the previous campaign, having as a main threat the competition of Turkish production. According to some Spanish growers this produce gets into Europe without adequate food safety control measures. The ratio of women working in the print media ranges at around 15 percent; only one publications director is female. Nurcan Akat, Turkey's first female general publications director, told bianet, "the situation of newspaper staff is deplorable" and explained the reasons. At the Turkish Grand National Assembly held discussion on the 20th anniversary of Khojaly genocide, APA reports. Turkey’s trade deficit narrowed to $7 billion in January, shrinking for a third consecutive month. The shortfall declined from $7.4 billion in January 2011, the statistics office in Ankara said on its website today. The gap exceeded the expectations of all 10 economists surveyed by Bloomberg, whose median estimate was $6.4 billion. It was $8.1 billion in December. Kibris reporter Ahmet Tolgay has written a revealing column under the banner: “Extraordinary interest from Israel for Cyprus”, where he refers to the investments of Israeli businessmen in the occupied area of Cyprus. Turkey is ready to share the pain of Armenians as they prepare to mark the 100th anniversary of the Armenian genocide in 2015, Turkish Foreign Minister Ahmet Davutoglu has said. “We want to share the pain of those who are ready to share it with us,” Davutoglu was quoted as saying by Anatolia news agency in an interview with state-run television TRT Haber late Tuesday. The Turkish director Yusuf Kurçenli died at the age of 65 in Istanbul of Turkey. Kurçenli was born in Çayeli, Rize Province, Turkey. He studied journalism at Istanbul University. A member of Saudi Arabia’s ruling family plans to invest $300m into a Turkish hotel chain, a newspaper report has claimed. Despite an uncertain world economy and much volatility in the nearby European Union, Turkey continues to grow. And a growing economy needs electric power. GE Energy, already a major supplier to Turkey’s power sector, recently announced new deals to supply the equipment for a major new gas-fired power plant in the Erzin District of southern Turkey, along with related services. The gigantic new plant will ultimately generate 900 megawatts, which is a whopping 2.6 percent of Turkey’s entire current electricity requirement. Ankara, too, knows there's no decisive military solution to terror, so it needs an agreement with the PKK. Is negotiating with terror organizations allowed? In Israel we already know the answer. It is. If the objective is to release a captive soldier, achieve a prisoner exchange or seal a cease-fire, negotiations aren't only allowed, they're desirable. Millions of pounds of British aid is being used to upgrade Turkey’s sewage system, MPs have been told. Tory MPs reacted with anger last night as details emerged of a little-known Brussels scheme to channel hundreds of millions of pounds a year of aid into countries such as Turkey that are seeking to join the European Union. ANKARA – Turkmen President Gurbanguly Berdymukhammedov is in Ankara for a two-day-visit, news media reported February 28. This is president’s first foreign visit after the election. President Nicolas Sarkozy has ordered his government to draft a new law punishing denial of the Armenian genocide after France's top court struck it down as unconstitutional. The issue of journalists who lost their jobs because of their political stance and whose situation was brought up by deputies from the European Union (EU) constituted one of the most interesting topics in last week’s meeting of the EU-Turkey Joint Parliamentary Commission in Istanbul. The mass, forced population exchange between Turkey and Greece nearly 100 years ago is being examined in a groundbreaking exhibition in Istanbul. The exhibition is seen as an important step in the growing rapprochement between the two countries that remained foes for much of the past century. The contest for leadership of the Dutch Labour party shifted from economic issues to racial and cultural ones on Tuesday after an on-air clash between the hosts of the country's top late-night talk show and a female candidate of Turkish descent. The campaign to succeed Job Cohen, Labour leader, who resigned last week, is viewed as a bellwether of trends among European social democratic parties, which have shifted left to defend social programmes as voter opposition to austerity policies grows. But economic and social issues scarcely got a hearing in the television appearance on Monday night of Nebahat Albayrak, a member of parliament and former deputy minister of justice who is one of five candidates for the Labour leadership. Ms Albayrak took offence when the hosts, Jeroen Pauw and Paul Witteman, began by asking whether the party was ready to be led by a woman of Turkish background. I wrote several posts about the Yilmaz Güney series that just wrapped up at Doc Films, in part because it was such an eye-opening experience for me. Save for a handful of festival titles and the films of Nuri Bilge Ceylan (Distant, Climates, etc. ), I’d spent zero time with Turkish cinema before this. The series provided a great overview, as Güney made movies both within the Turkish studio system and as an independent. His amazing life story spans the entire class system of postwar Turkey, as he went from an impoverished Kurdish background to mainstream celebrity to political martyrdom (and ultimately exile) between the years of 1937 and 1982. In the best films of the series—Hope, The Friend, Yol—Güney conveyed this complex experience artfully and stirringly. Court sets a week of court hearings in April for witness testimony. ISTANBUL – Judges in Turkey's southeastern city of Malatya have announced the preparation of an indictment in the case of three murdered Christians that is expected to reveal a shadowy network that incited five young men to carry out the crime. PARIS — France's Constitutional Council ruled Tuesday that a French law concerning the mass killings of Armenians a century ago violates the country's constitution. French President Nicolas Sarkozy, who had personally backed the law, immediately said he would ask the government to prepare a new bill taking into account the council's ruling. Interview with Fuad Alasgarov, chief of the department for work with law-enforcement bodies of the Presidential Administration of Azerbaijan. The 24th anniversary of the Sumgayit events is drawing near. Last year Congressman Adam Schiff tried to raise the issue in the US Congress. This year a bill on an "Armenian genocide" in Sumgayit was even presented for consideration in the legislative body of the state of California. Do you think that there is a great threat of a bill on the so-called "Armenian genocide"? “Never was any nationality, religion or belief group oppressed in these lands. On the contrary, they were treated as equals, with respect, and their cultural heritages were conserved,” Huseyin Avni Mutlu, Istanbul’s governor, recently said at a Holocaust commemoration ceremony. Still, though twenty thousand Jews currently live in Turkey, all is not as it seems in this Middle Eastern country. Turkish private equity firm Brightwell Holdings has withdrawn a bid to buy bankrupt Swedish carmaker Saab owing to a lack of cooperation from former owner GM, a Swedish daily reported Tuesday. Nebahat Albayrak, an ethnic Turk, will stand for the election of chairman of the Netherlands’ main opposition, the Social Democratic Labor Party, after the resignation of Job Cohen, daily Hürriyet has reported. Turkey’s benchmark ISE National 100 Index rose 1.2 percent to 59,543.81 at 10:39 a.m. in Istanbul after a 1.5 percent fall yesterday. The following stocks are active. Stock symbols are in parentheses. CarrefourSA Carrefour Sabanci Ticaret Merkezi AS (CARFA) , the grocery store chain owned by France’s Carrefour SA (CA) and Haci Omer Sabanci Holding AS (SAHOL), surged 8.9 percent to 16.50 liras, its highest in almost seven months, after Vatan newspaper reported U.K.-based retailer Tesco Plc. (TSCO) was interested in buying the company. No decision has yet been made regarding Sabanci’s shares in CarrefourSA and the company continues to study strategic options, according to a statement made by Sabanci to the Istanbul Stock Exchange today. Sabanci shares increased 1.4 percent to 7.36 liras. Two of the world's most ancient and grand civilizations are now also among the fastest-growing economies on the modern stage. They are also extending their bilateral trade relations, reflecting their growing dominance in global financial affairs. ISTANBUL, Turkey, Feb. 28 (UPI) -- The Turkish government, in an effort to prevent violence against women, has prohibited sexist military marches, officials say. The Assembly of Turkish American Associations (ATAA), Federation of Turkish American Associations (FTAA), Turkish American Community Centers (TACC), Azerbaijan American Council (AAC) and Azerbaijan Society of America (ASA) welcome the U.S. Court of Appeals for the 9th Circuit's invalidation of a law designed to provide special treatment for California Armenians, in Movsesian v. Victoria Versicherung, et al. on February 23, 2012. The Court decided 11-0 that the so-called Poochigian Law was invalid because it unconstitutionally interfered with U.S. foreign policy not to prejudice Turkey with an unproven allegation of genocide. Click here to read the opinion of the Court. A Saudi hotel developer will invest $300 million in Turkey, to increase the number of his company’s “My Tuana” hotels, the Hurriyet Daily News website reported on Tuesday. 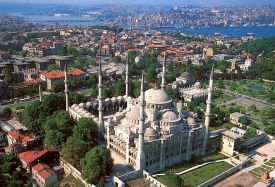 Increasing interest in Turkey has been the result of a recent tourist influx into the country after the Arab Spring unrest had hit popular Middle East tourist destinations throughout 2011. ISTANBUL – Turkey's Sabanci Holding (SAHOL.IS) said Tuesday no decision has been taken on shares in its joint venture with French retailer Carrefour SA (CA.FR), denying local media reports. UNITED NATIONS (A.A) - Turkey's deputy family and social policies minister said on Monday that Turkey was the first country that signed and ratified the Council of Europe (COE) Convention on preventing and combating violence against women and domestic violence. ISTANBUL, Feb 28 (Reuters) - The Turkish lira recovered against the dollar and bonds also got a boost on Tuesday as a dip in oil prices eased concerns about the country's huge current account deficit and double-digit inflation. Jesus, in the newly discovered Gospel, which had been hidden in Turkey for the past 12 years, allegedly bears strong resemblance to the Islamic view of Jesus, according to Turkish culture and tourism minister Ertugrul Gunay. LONDON, February 28, 2012 /PRNewswire via COMTEX/ -- UBM plc today announces that it has formed a strategic partnership with NTSR, a leading Turkish exhibition company, to create an operations and logistics hub which will provide a local platform for UBM's planned growth in Turkey and across the wider region. With more than 30 years' experience, NTSR is one of the best known and respected events businesses in Turkey. Turkish movie-theater bookers were less than enthusiastic when two directors — Mehmet Binay and Caner Alper — approached them with a film inspired by the true story of a 26-year-old killed, allegedly by his father, for being gay. Even though Binay and Alper's film, Zenne Dancer, had won awards, they were told that Turkey was not ready for a mainstream gay movie. ANKARA, Turkey — A 27-year-old Turkish man who underwent the world’s first would-be quadruple limb transplant died Monday, hours after the limbs were removed due to metabolic failure, the hospital said. Today, the Turkish parliament will discuss the recognition of the Khojaly genocide, the parliament said. Feb. 28 (Bloomberg) -- Eight months after Prime Minister Recep Tayyip Erdogan won an election landslide vowing to build roads, bridges and power plants, his plans are threatened by a financing shortfall of at least $15 billion. Intel Capital, the investment arm of technology conglomerate Intel, is set to open a new office in Turkey within the next 12 to 18 months as its head of investment for the region said the country had the "potential to create a very liquid stock market". 'Turkey, SOS! '—Tatar Nationalists picketing the Turkish Consulate in Kazan, February 2012. Maxim Edwards/KH. On 21 February, three Tatar nationalist activists from the Azatliq (Freedom) movement picketed the Turkish Consulate in Kazan to gain Turkish support for their cause. The picket has apparently become a tradition. The strong words on the banners seemed to compensate for the modest size of their protest. “In Russia today” begins one banner, “there is an unspoken linguistic, spiritual, and cultural genocide of Turkic nations. Turkey, do not be silent!” On the other side of ulitsa Gorkogo, the Turkish consulate didn’t seem to stir. In the past 10 years the relationship between Turkey and the European Union (EU) has transformed drastically. A decade ago, Turkey lacked any real economic growth, which translated into low self-esteem nationally. Turkey, believing its only solution was to become a member of the European community, desperately hoped for a successful bid into the EU. This perception, however, that Turkey has to subsume itself under the European continent and become a member of Europe in order to succeed, is now history. The Turkish foreign minister is seeking to make Istanbul a center for mediation in resolving international crises. The initiative comes as Ankara seeks to resolve the conflict in Syria and tensions over Iran's nuclear energy program. (by Rodolfo Calo') (ANSAmed) - ANKARA, FEBRUARY 27 - Official figures for cultural activity released in Turkey this year show what is practically a summary of a thriving cultural scene under the Erdogan era. Technology and art are colliding in Turkey. Museums in Turkey will soon be offering 3D visual systems (probably stereoscopic in nature) to bring in more visitors to the nation's museums and add a technological touch to their ancient exhibits. ANKARA — Turkish surgeons removed both arms and legs from a patient who underwent what was touted as the world's first quadruple limb transplant due to metabolic complications, the hospital said on Monday. Fifty-two doctors from Ankara's Hacettepe University Hospital performed the transplant on Friday, attaching two arms and two legs to Sevket Cavdar. Coach Özgür Gözüacik earned the respect of her players – and the attention of the media – after breaking into one of the world's most male-dominated professions: professional soccer. Istanbul’s sole female coach, the 29-year-old yearns for a championship. Viacom International Media Networks (VIMN) has announced the signing of a new deal with satellite platform Digiturk that will see six of its channels air across the Turkish market for the next six years. Digiturk, which serves the majority of Turkish pay-TV subscribers, will commence broadcasting MTV and MTV Live HD on March 1. This will be the first time that MTV’s HD channel has been made available in the Turkish market. The MTV flagship channel will be broadcast with localised Turkish language subtitles. Feb 27 (Reuters) - The Turkish Football Federation (TFF) elected Besiktas' Yildirim Demiroren as its new chairman on Monday, setting him the task of quickly resolving a match-fixing crisis which has engulfed Turkey's domestic league this season. Tens of thousands of Turks, vawing Azeri flags, rallied Sunday to mark the anniversary of a notorious attack that Azerbaijanis say killed hundreds of people during the 6-year war with Armenia over Nagorno-Karabakh, an ethnic Armenian enclave in Azerbaijan. PODGORICA, Montenegro - US forces are operating a new radar defense site in Turkey that could help defend Europe from a potential Iranian ballistic missile attack, the Army’s commander in Europe said yesterday. “We have the forces in place . . . at a radar site in southern Turkey,’’ Lieutenant General Mark Hertling said in an interview at Montenegro’s main military airport in its capital. `Turkey a model for new Arab states` Dubai: With old establishments crumbling in the face of a democratic upsurge, a majority of people in the Arab world are looking up to Turkey as a political model that post-revolutionary states in the region should adopt. (Reuters) - General Ilker Basbug, the former head of Turkey's armed forces, said military discipline has helped him adapt to prison life, but he still cannot accept the idea that he stands accused of being the leader of a terrorist group. Ricardo QuaresmaIn yet another exciting rendition of the Istanbul Derby, Besiktas’ courageous efforts were undone by defensive frailty, and the Black Eagles were made to concede a vital three points, all but surrendering the Super Lig title. Turkish Prime Minister Recep Tayyip Erdogan, meeting with Libya's interim prime minister Abd al-Rahim al-Keeb in İstanbul on Saturday, said Turkey would continue to extend support to Libya, Today's Zaman reported. "We have given full support to the Libyan transition process so far and we will continue our support to the country in the best way we could. I believe Libya will have transparent and fair elections, as it was scheduled to," Erdogan stated, referring to coming elections in June in Libya, during a joint press conference with al-Keeb. The sales come at a delicate time. Israel has been laboring hard to form diplomatic alliances in a region that seems to be growing increasingly hostile to the Jewish state. An aerial view, as the aircraft descends for a landing at Istanbul’s Ata Turk international airport, brings into focus, the wide expanse of Bosporus, the waterway provides the continental divide between Asia and Europe. Turkey, by the very nature of its geographical layout is a nation at crossroads, being one and only Eurasian State. The erstwhile Soviet Union could claim to be another; however with its break-up, the Central Asian States are an entity apart from European Russia. Interview with Gareth Jenkins – a senior associate fellow with the Silk Road Studies Program and Turkey Initiative with Jones Hopkins University. Mr. Jenkins, thank you very much for joining us. So, what are your impressions of the visit? They talked mostly about trade and I think they expressed a desire to boost it, bilateral trade at the moment is 24 billion and they are talking about quadrupling it to a hundred billion. But of course the problem of course concerns China most is that Turkey has got a huge imbalance in trade. So, I heard they discussed how to try to boost Turkish exports but things are going to be extremely difficult. Fifty-two doctors from Ankara's Hacettepe University Hospital performed what was reported as the world's first-ever quadruple limb transplant on Friday, attaching two arms and two legs to Sevket Cavdar. PODGORICA, Montenegro (AP) — American forces are now manning a new radar defense site in Turkey that could help defend Europe from a potential Iranian ballistic missile attack, the U.S. Army's commander in Europe said Sunday. ISTANBUL -- After the formation of the Turkish secular state on the ruins of the Ottoman Empire, reference to the country's imperial era was generally frowned upon. But the days of Turkey ignoring its past are history. ANKARA, Turkey — Tens of thousands of Turks, vawing Azeri flags, rallied Sunday to mark the anniversary of a notorious attack that Azerbaijanis say killed hundreds of people during the 6-year war with Armenia over Nagorno-Karabakh, an ethnic Armenian enclave in Azerbaijan. HACIPASA, Turkey (AP) — For generations, the economy of this Turkish hamlet has thrived on items such as livestock and cigarettes that are smuggled across the border from Syria in an area of lax security. Turkey’s prime minister called on Libya on Saturday to disband militia forces to restore security and assume full power in the country, even as his Libyan counterpart invited Turkish companies to return to Libya to finish construction projects worth billions of dollars. The head physician at a Turkish hospital says his team has performed the world's first quadruple limb transplant, attaching two arms and two legs to a young man. Women are the victims of increasing violence in the eastern province of Van, where difficult conditions in the wake of last year’s devastating earthquakes are pushing residents to the brink, Hurriyet Daily News reports. “[People] who did not used to live with their mothers- and fathers-in-law now [find] they have to live together with them. Slander and quarrels can sometimes arise between those who share the same tent with their relatives. Women [can be] subjected to violence from their fathers-in-law and their husbands,” said Esen Günay, a member of the Van Women’s Association (VAKAD). ANKARA — Turkish surgeons have performed the world's first-ever quadruple limb transplant at a university hospital in Ankara, the Anatolia news agency reported on Saturday. "In such a big organ transplant... more than 50 percent of the (patient's) body has changed," Professor Murat Tuncer, rector of Ankara's Hacettepe University, told Anatolia. ANKARA, Turkey — Turkey’s prime minister has called on Libya to disband militia forces to restore security and assume full power in the country, even as his Libyan counterpart invited Turkish companies to return to Libya to finish construction projects worth billions of dollars. At a time of battered bilateral political relations, Turkish and Israeli musicians continue to bridge differences. Although music alone doesn't have the power to transcend all political problems, it does keep some level of people-to-people contact alive, helping to create better understanding between cultures. At the regular Turkey-EU parliamentary meeting, Dutch MP Barry Madlener once again criticized the curtailing of free speech in Turkey. Ankara must show the courage to apologize for its role in the Struma tragedy in which 764 people died in the Black Sea after being neglected by Turkey while escaping from the Holocaust, a leading Jewish-Turkish business has said. “Just like German Chancellor Angela Merkel apologized for Turks who were murdered by neo-Nazis, Ankara must have the same courage,” İshak Alaton said. Turkish Prime Minister Recep Tayyip Erdogan's statement was read out at a conference in Istanbul, dedicated to the 20th anniversary of Khojaly genocide. Products from numerous fields will be presented - pharmaceutical and food industries, agriculture, packaging, hotel equipment, glassware, shoes, medicine, toys, education, tourism, security systems, furniture, textile, household appliances, fashion and construction materials. ANKARA, Turkey — The head physician at a Turkish hospital says his team has performed the world’s first quadruple limb transplant, attaching two arms and two legs to a young man. When he first arrived in what was, back then, British-controlled Palestine, no one was especially interested in hearing David Stoliar’s astonishing story, even though he was the sole survivor of the sinking of the SS Struma, a rusting steamer with almost 800 Jewish refugees aboard when it was torpedoed off the Turkish coast. ANKARA, Turkey — An official says a hatch inside a dam burst, causing flooding that has left 10 construction workers missing in southern Turkey. Gov. Huseyin Avni Cos of Adana province said Friday that the hatch could not hold under high pressure after heavy rains. Feb. 24 (Bloomberg) -- The lira was the biggest-losing emerging-market currency against the dollar and yields rose the most in six weeks as rising oil prices revived concern on the current account deficit. Schafik, a 20-year-old who prefers not to provide his real name, is last in the rebel chain of command. Until about four weeks ago, he served in Syrian dictator Bashir Assad's army. As a soldier, he had been ordered to fire on men, women and children demonstrating against the regime. Now, he's waiting for orders in Turkey to fight against his former comrades-in-arms. ANKARA: The Turkish government may have won Western plaudits for its outspoken criticism of the Syrian regime but it stands accused in some quarters back home of losing influence over its neighbor as a result. KUALA LUMPUR: Some 70 Turkish companies are taking part in a three-day Turkish Products Exhibition to be held at the Kuala Lumpur Convention Centre (KLCC) from March 1. ISTANBUL--APCO has named Zeynep Dereli as MD of its new Istanbul office. Prior to joining APCO, Dereli was general coordinator and founding member of the Istanbul think tank Turkish Policy Forum, and founding partner of Glow Communications. She also served as director of the Atlantic Council's Black Sea Energy and Economic Forum, an annual initiative that brings business and policy leaders together to discuss Eurasia's leading economic and energy challenges. ISTANBUL, Feb 24 (Reuters) - The Turkish lira gained respite on Friday, rising after a sell-off driven by concerns about the impact on the energy-dependent economy of rising oil prices, which remain a key risk, while bond yields climbed on profit-taking. ISTANBUL—As Turkey welcomes Syrians fleeing violence, the anniversary Friday of the deaths of more than 750 Jewish refugees who were denied shelter by Turkey in World War II was a reminder of perennial tension between pragmatic and humanitarian impulses. Eaton Agrees to Acquire Turkish Hose Manufacturer Polimer Kaucuk Sanayi ve Pazarlama A.S.
CLEVELAND, Feb 24, 2012 (BUSINESS WIRE) -- Diversified industrial manufacturer Eaton Corporation ETN +0.17% today announced it has agreed to acquire Polimer Kaucuk Sanayi ve Pazarlama A.S., a Turkish manufacturer of hydraulic and industrial hose. The company's headquarters are located near Istanbul and many of its products are sold globally under the SEL Hose brand name. The company's primary markets include construction, mining, agriculture, oil and gas, manufacturing, food and beverage, and chemicals. The deal is subject to customary closing conditions. Terms were not disclosed. Feb 24 (Reuters) - Turkish retail group Boyner Holding, which owns listed Boyner Magazacilik, said on Friday it acquired 63 percent of Turkish retailer YKM for 190 million lira ($108 million). Feb 24 (Reuters) - The number of foreign visitors to Turkey rose 0.6 percent year-on-year in January to 0.98 million people, the Tourism Ministry said on Friday, after climbing 2.47 percent the previous month. At first they served the regime, but now they are fighting against it. Operating out of southern Turkey, units of the Free Syrian Army, driven by hatred toward Assad, are infiltrating their home country and fighting soldiers loyal to the dictator. SPIEGEL ONLINE visits the troops. The Turkey-Azerbaijan Parliamentary Friendship Group issued a statement on the Khojaly tragedy yesterday, sharply condemning the events of Feb. 26, 1992, the Anadolu agency reported. Whenever an old alliance comes apart, our foreign-policy establishment behaves like the spouse who pretends away a partner’s ever-more-flagrant infidelities—hoping that patience and indulgence will somehow bring the straying party around. But real life doesn’t work that way for lovers or for states. When we look away from shameless betrayals, it only encourages further bad behavior. Boyner Buyuk Magazicilik AS (BOYNR), a Turkish department store chain, headed for the highest level since October after a report its owner has bought a majority stake in the YKM chain of department stores. Turkey, the fastest growing economy after China, is being penalized in the credit markets for its failure to promote consumer savings. While Turkey’s economy has grown at an average pace of 5.9 percent since 2002 and its bonds are showing the fastest recovery among emerging markets from last year’s rout, its credit ratings are stuck at the same level as Serbia and Guatemala, whose economies are about a twentieth its size. That’s costing the country about $8 million more for every $1 billion it borrows on international markets than Russia, where the bond market is half the size of Turkey’s, according to JPMorgan Chase & Co. EMBI indexes. Lehigh Dining Services brought in chef Mehmet Yoldas of Turkey to prepare an array of Turkish dishes for students as a part of the Global Chef Program. Yoldas has been traveling and cooking for four years in places like Italy, France, Spain, and Russia. Turkey must cooperate for a Cyprus solution in order to materialize its policy priorities concerning the EU and the region, President Demetris Christofias said today. While addressing the book presentation of the Head of the Presidency’s office of research on Turkish policy, Nikos Moudouros on “The transition of Turkey, from Kemalist dominance to Islamic neoliberalism”, the President spoke on the role of the Turkish leadership in sidelining the former leader of the Turkish Cypriot Community Rauf Denktash, while promoting the acceptance of the Annan Plan in 2004. Lockheed Martin says it is preparing to dramatically increase flight testing of the F-35 Joint Strike Fighter this year, with plans including the first firing of live weapons. Turkish Export Product Fair, including 42 Turkish companies interested to invest in FYR Macedonia, opened in Skopje on Thursday. Islamabad—World’s biggest peace offensive initiative is to don the form of an international brain-storming event for two consecutive days from tomorrow, Feb 24-25, 2012, in Istanbul/Turkey, drawing peace promoter, diplomacy-builders, experts and academicians from all continents for collective input. This first ever Turkish initiative having support of the U N is to set a new diplomatic syllabus for resolution of disputes under “Enhancing Peace Through Mediation” raft, letting wider space to the NGOs, UN and Turkish vision of global mediation and alternatives, international reports said Thursday. A federal appeals court on Thursday struck down a novel and controversial California law that allowed descendants of 1.5 million Armenians who perished in Turkey nearly a century ago to file claims against life insurance companies accused of reneging on policies. ISTANBUL // Increased efforts by Turkey to attract Arab investors and improve relations with China are signs that Ankara is looking for new partners beyond Europe, analysts have said. The West could use Turkey’s experience in engaging efforts to solve Iran’s disputed nuclear program, International Crisis Groups said in a report, warning that if the West does do its utmost to revive the diplomatic option, it runs the risk of cornering itself in a high-cost war for uncertain gains. It’s by now axiomatic that democratic, prosperous, NATO member Turkey offers a valuable model for more troubled countries in the Middle East to follow. That remains broadly true, but Turkey itself appears to be losing its way. News.Az interviews Sarah Akram, research fellow at the Institute of Strategic Studies, Islamabad. How would you assess Turkey's role as a new leader of the Muslim world? ISTANBUL - Visiting Chinese Vice President Xi Jinping called here on Wednesday for more efforts in boosting trade and economic cooperation between China and Turkey. Xi made the call when addressing a Sino-Turkish business forum in Istanbul. This is the final major event for Xi's stay in Turkey and for his three-nation tour. ...The "Young Turks," a duo of satirist/commentators who have built a large audience online and now also appear on the cable channel "Current TV" (which, to make sure I push all the buttons, is affiliated with Al Gore), did a segment mocking what they considered racial stereotyping in the Minnesota Majority graphic, since the cartoon convict is a black man and the illegal immigrant is portrayed as man in mariachi costume and a sombrero. THE two Irish women killed in Turkey last August had been stabbed over 50 times, a court heard yesterday. Marion Graham (54), from Newry, and Cathy Dinsmore (53), from Warrenpoint in Co Down, were both killed in an attack by local man Recep Cetin, the boyfriend of Ms Graham's teenage daughter Shannon. Turkcell Iletisim Hizmetleri AS (TCELL), Turkey’s biggest mobile phone operator, forecast that sales will increase in 2012 by as much as 7.8 percent to a range of 9.9 billion liras ($5.6 million) to 10.1 billion liras from 9.37 billion liras last year. Olympic 800 metre champion Pamela Jelimo leads Kenya hunt for medals at the world indoor championships between March 9-12 in Istanbul, Turkey. Jelimo who seems to be regaining her form of 2008 will lead eight others to the three day event in the Bosphorus. Jelimo hit a sub- 2 minute time in an indoor meeting in the French city of Lievin a week ago to signal her return to form and will be looking to send out a warning to her rivals that she is regaining her form ahead of the London 2012 Olympics in July. The decision of the French Senate to give final approval to a bill that threatens deniers of the Armenian genocide with a fine of €45,000 or one year in jail, or both, is politically inept and ethically objectionable. Although France’s Constitutional Council has yet to issue a ruling on the constitutionality of the law, it is not too early to denounce the limitation it sets on freedom of expression. After a series of changes in the personnel of the police and the judiciary pursuant to the summoning of MİT officials to give their statements, now the MİT Istanbul Regional Chairman was deposed form office. After top rank executives of the National Intelligence Agency (MİT) had been summoned to give their statements about two weeks ago, a series of new appointments at the police and the judiciary had followed. Now, a new change of personnel was announced for the MİT. United Airlines, a wholly owned subsidiary of United Continental Holdings, Inc. announced plans to launch daily, nonstop flights between its New York hub, Newark Liberty International Airport, and Istanbul, effective July 1, 2012, subject to government approval. Westbound service from Istanbul begins July 2. Madonna concert Istanbul : Tickets on sale Feb 24 ! Tickets for Madonna ‘s much awaited concert in Istanbul, Turkey will be on sale Feb 24. Istanbul / NationalTurk – Madonna will perform at Türk Telekom Arena in Istanbul on June 7 as part of her Madonna World Tour 2012. Madonna will be toring for the first time in three years. Tickets for the upcoming Madonna concert , which will take place on June 7 at Istanbul’s Türk Telekom Arena will go on sale Feb. 24 at 10 a.m.
More:Madonna concert Istanbul : Tickets on sale Feb 24 ! 1500 year-old ‘ Syriac ‘ Bible found in Ankara, Turkey : Vatican in shock ! The relic was ‘rediscovered’ in the depositum of Ankaran Justice Palace, the ancient version of bible is believed to be written in Syriac, a dialect of the native language of Jesus. More:1500 year-old ‘ Syriac ‘ Bible found in Ankara, Turkey : Vatican in shock ! FOR nine years Turkey’s prime minister Recep Tayyip Erdogan has moved smoothly from one victory to another, winning three elections in a row with a bigger share of the vote each time. He has seen off coup plots by once-omnipotent generals and attempts by their cronies in the judiciary to ban his mildly Islamist Justice and Development (AK) party. So far the economy has survived the financial crisis largely unscathed. And although membership talks with the European Union are stuck, relations with America are (in the words of the foreign minister, Ahmet Davutoglu, who recently spent five hours with Hillary Clinton) in “a golden age”. Statue with feet of clay? EVERY November 10th, at 9.05am precisely, sirens wail, the traffic stops and pedestrians stand in silence to pay their respects to Kemal Ataturk, founder of modern Turkey, who died at that time in 1938. A military hero who rescued Turkey at the end of the first world war, Ataturk invented a new identity from the old Ottoman empire. It was Ataturk’s embrace of rigid secularism and Western reforms that underlay Turkey’s recovery. (CN) - Turkish courts should not have fined a writer roughly $5,700 for two scathing editorials that criticized the prosecution of journalists by Prime Minister Recep Tayyip Erdogan, the European Court of Human Rights ruled. Erbil Tusalp, 67, has written several books and contributes columns to the daily newspaper Birgün, two of which landed him in the government's crosshairs. A recent analysis published on the website of Committee to Protect Journalists (CPJ) slams the treatment of journalists in Turkey, saying that many journalists - especially Kurdish and leftist sympathizers - face extremely harsh legal treatment. Turkey has that most scarce, yet highly sought-after, attribute among European economies: growth. With this rising tide, is now the time for investors to be contemplating Turkey's growing Internet economy? Ankara feels that enough is enough, it has already done its part in attempting to push its EU membership negotiations forward and will not make any more concessions, Turkey's newly appointed Ambassador to the EU, Selim Yenel, told a conference, on 21 February, on Turkey's priorities and challenges in 2012. While he conceded that his country’s relationship with the bloc was at a very low point, he said that his mission was to “prevent things from getting worse”. He said that Ankara had nothing left to offer to the EU and that his government was “fed up” with the current stalemate. More than 400,000 Jewish people living in Europe have chosen their “deputies” by casting their votes via internet and two of these 120 deputies are from Turkey. Visiting Chinese Vice President Xi Jinping addressed a Sino-Turkish business forum in Istanbul on Wednesday, calling for joint efforts to boost bilateral trade and economic cooperation into a higher level. This is the final major event for Xi's stay in Turkey and for his three-nation tour. A young woman born in Khojaly has told a Turkish newspaper why she wrote to the Armenian and French presidents about the massacre in her town. Tehran, Feb 21, IRNA – Foreign Minister Ali Akbar Salehi said on Tuesday that Turkey is ready to host talks between Iran and G5+1 but other countries might voice readiness to play hosts to the negotiations. If a project has no deadline, is it really a project? What do you call a negotiation process in which the partners can't talk about key issues? These are existential times for Turkey's campaign to join the European Union -- an ambitious vision that has become increasingly ambiguous. When accession talks began in 2005, the idea was that Turkey's Muslim population would enrich the continent, culturally and economically, with Turkey itself destined to become a European-style democracy that could serve as an east-west bridge. More than six years later, doubt haunts hope. Economic troubles mean that Europe, where skepticism toward the Turkish bid was already building, has little energy to expand, while in Turkey reform efforts have slowed and the nation has sought to carve out a leadership role in the Middle East. Muscat: Two Turkish actors, both favourite with Arab cinegoers, are going to be a major attraction at the Seventh Muscat International Film Festival (MIFF). Kivanc Tatlitug and Songul Oden — better known by their popular screen names Muhannad and Noor — will grace the Red Carpet on March 31 and will also be honoured at the MIFF on the same day. NANJING - Overjoyed at the fantastic scenery of the Bosporus and the Blue Mosque, tourist Niu Dawei said that the unexpected enthusiasm of Turkish people was an even greater pleasure. "If I stayed at the roadside by myself for more than five seconds, Turkish passers-by would ask me if I needed any help," said the 32-year-old, who traveled to Turkey in 2011. BEIJING - Exchanges between China and Turkey began more than 2,000 years ago as a result of the ancient Silk Road. ISTANBUL // Leaders of Turkey's small Christian community have hailed as historic a meeting with Turkish lawmakers to discuss the country's new constitution, but the visit also highlighted the challenge of securing rights of minorities in this mostly Muslim nation. The Kayseri municipality has embarked on an ambitious project to convert Turkey’s Mount Erciyes into the world’s second leading winter tourism center after the European Alps. Turkey’s benchmark ISE National 100 Index (XU100) fell 0.3 percent to 61,252.83 at the 5:30 p.m. close in Istanbul, paring four days of gains. The following stocks were active. Stock symbols are in parentheses. Denizbank AS (DENIZ) , Dexia SA (DEXB)’s unit in Turkey, advanced 1.6 percent to 13.05 liras, the highest level in almost two weeks. There is a “plan B” should a sale of the bank by Dexia fall through and it will increase profitability, chief executive Hakan Ates told reporters in Istanbul today. Qatar National Bank SAQ’s talks to acquire Denizbank are stalled over price and may collapse, people with knowledge of the process said on Feb. 18. EDISON — A mobile phone one-stop shop, a boutique offering distinctive and colorful carry-alls, and a Middle Eastern restaurant making its U.S. debut are among the new tenants that recently opened or will open in the coming months at Menlo Park Mall, spokeswoman Suzy Lichter said. Several museums in Istanbul are holding major exhibitions of famous Dutch paintings to mark 400 years of diplomatic relations between Turkey and the Netherlands. Ties between the two countries go back to 1612, when Cornelis Haga presented his credentials to Sultan Ahmet I as the first ambassador the Dutch Republic sent to the Ottoman Empire. ANKARA, Feb 21 (Reuters) - Turkish state officials failed to protect prominent Turkish-Armenian journalist Hrant Dink, murdered in 2007, despite knowing of the plot to kill him, a report commissioned by the president has concluded. A conference marking the 20th anniversary of Khojaly genocide took place at the Giresun University, Turkey. ISTANBUL, Turkey — If a project has no deadline, is it really a project? What do you call a negotiation process in which the partners can't talk about key issues? These are existential times for Turkey's campaign to join the European Union -- an ambitious vision that has become increasingly ambiguous. ISTANBUL—The Turkish lira fell on Tuesday as Turkey's central bank unexpectedly cut its overnight lending rates and issued a more dovish assessment of global monetary conditions. ANKARA, Feb 21 (Reuters) - Negligence by Turkish state officials led to the 2007 killing of prominent Turkish-Armenian journalist Hrant Dink, and a flawed murder investigation undermined public trust in the security services, a report commissioned by the president has concluded. ANKARA, Turkey — China and Turkey on Tuesday set aside differences on how to deal with the raging violence in Syria and signed a three-year currency swap deal worth $1.6 billion (€1.2 billion) to enable bilateral trade in local currencies.